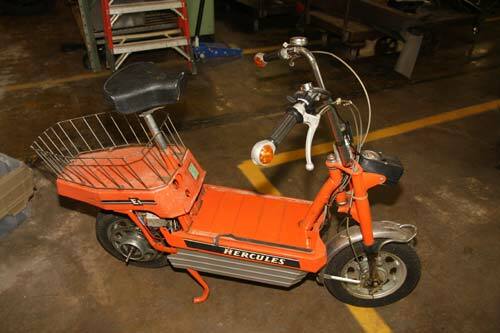 Hercules was founded in 1886 by Carl Marschütz as a bicycle manufacturer in Nuremberg, Germany. The first Hercules motorcycle debuted in 1904. Marschütz, being Jewish, fled to America during World War II, and by the end of the war 75% of Hercules’s factories had been destroyed. German automotive parts company ZF Sachs purchased the company in 1963. 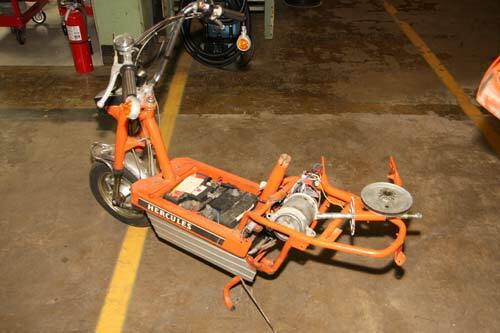 In response to the 1973 oil crisis, Hercules had developed an all-electric scooter, the E1. The 750 watt Bosch electric motor uses two 12 volt lead-acid car batteries. The E1 was primarily used for short trips in urban environments.